Barry Eugene White (born Barrence Eugene Carter, September 12, 1944(1944-09-12) – July 4, 2003) was an American record producer, songwriter and singer.A multiple Grammy Award-winner known for his deep bass voice and romantic image, White's greatest success came in the 1970s with the Love Unlimited Orchestra, crafting many enduring hit soul and disco songs. Worldwide, White had many gold and platinum albums and singles, with combined sales of over 100 million, according to critics Ed Hogan and Wade Kergan. White was born in Galveston, Texas and grew up in the high-crime areas of South Central Los Angeles, where he joined a gang at the age of 10. At 17, he was jailed for four months for stealing $30,000 worth of Cadillac tires. While in prison, White listened to Elvis Presley singing "It's Now or Never" on the radio, an experience he later credited with changing the course of his life. After his release, he left gang life and began a musical career at the dawn of the 1960s in singing groups before going out on his own in the middle of the decade. The marginal success he had to that point was as a songwriter; his songs were recorded by rock singer Bobby Fuller and TV bubblegum act The Banana Splits. He was also responsible in 1963 for arranging "Harlem Shuffle" for Bob & Earl, which became a hit in the UK in 1969. He discovered disco artist Viola Wills in 1965, and signed her to Bronco Records. In August 1969, he got his break producing a girl group called Love Unlimited. Formed in imitation of the legendary Motown girl group The Supremes, the group members honed their talents with White for the next two years until they all signed contracts with 20th Century Records. White produced, wrote and arranged the classic soul ballad "Walking in the Rain (With The One I Love)", which hit the Top 20 of the pop charts. The group would score more hits throughout the '70s and White eventually married the lead singer of the group, Glodean James. While working on a few demos for a male singer, the record label suggested White step out in front of the microphone, to which he reluctantly agreed. His first solo chart hit, 1973's "I'm Gonna Love You Just a Little More Baby", rose to #1 R&B and #3 Pop. That same year, the Love Unlimited Orchestra's recording of White's composition "Love's Theme" reached #1 Pop in 1974, one of only two instrumental recordings ever to do so. Some regard "Love's Theme" as the first disco hit ever. Other chart hits by White include "Never, Never Gonna Give You Up" (1973), "Can't Get Enough of Your Love, Babe" (1974), "You're the First, the Last, My Everything" (1974), "What Am I Gonna Do With You" (1975), "Let the Music Play" (1976), "It's Ecstasy When You Lay Down Next To Me" (1977), "Your Sweetness is My Weakness" (1978), and "Change" (1982). Considered handsome and deeply romantic by his many female fans and admired for the unique blend of soul and classical orchestral musical elements he created, White was often affectionately referred to as the "Maestro" or "The Man with the Velvet Voice". His portly physical stature led some in the popular press to make condescending jokes about his weight by referring to White as the "Walrus of Love," a moniker considered disrespectful by many fans. 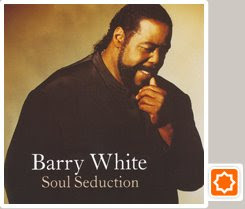 Barry White was also referred to as "The Sultan of Smooth Soul," but it was his role as brainchild of the funk-fueled, deep soul band, the Love Unlimited Orchestra, in which he was widely branded on several early albums as the group's Maestro, earning him the only documented nickname for which he and his musical colleagues were responsible. Although White's success on the pop charts slowed down as the disco era came to an end, he maintained a loyal following throughout his career. In the 1990s, he mounted an effective comeback with the albums The Icon Is Love (1994), whose biggest hit, "Practice What You Preach" reached the top of the charts. In 1996, White recorded the incredibly steamy "Wildest Dreams" with rock icon Tina Turner. Staying Power (1999) won 2 Grammy Awards. In addition, his music was often featured on the sitcom Ally McBeal and he appeared on the show twice. White had been ill with chronically high blood pressure for some time, which resulted in kidney failure in the autumn of 2002. He suffered a stroke in May 2003, after which he was forced to retire from public life. On 4 July, 2003, he died at Cedars-Sinai Medical Center in Los Angeles from renal failure. White was cremated, and his ashes were scattered by his family off the California coast. On 20 September, 2004, he was posthumously inducted into the Dance Music Hall of Fame at a ceremony held in New York.